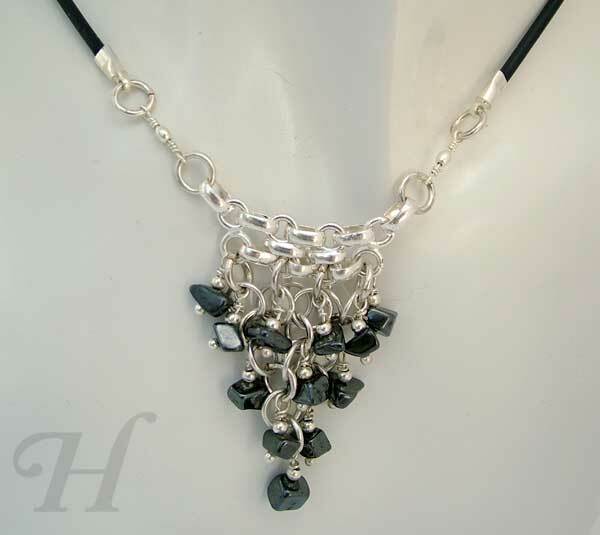 Beaded necklace with hematite gemstones and chain maille play. I have spats of wanting to make "clean" jewelry and then at other times, "wildly exotic" jewelry. One night, in my "clean" mode, I was playing around with chain maille and this whole "Triangulation" series more or less formed by themselves. This is one from that series. 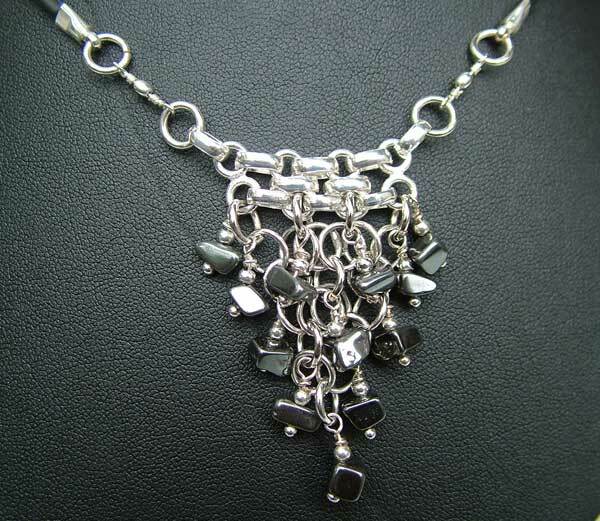 It focuses on chain maille made in simple, classic, triangle shapes. Earrings came to life to match each necklace from the series. 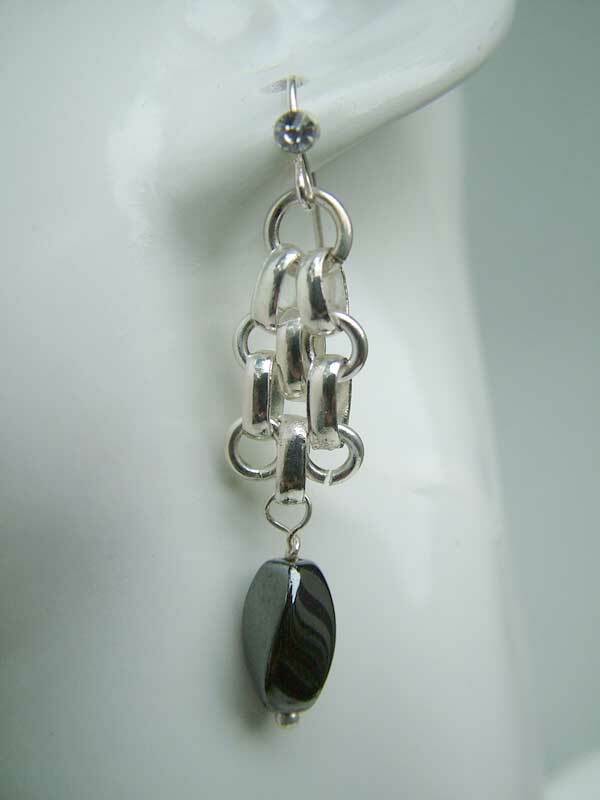 Chain maille in a versatile triangle shape. One in a series of "Triangulation" jewelry sets. Though I must confess that my inner being leans more towards creating the "wildly exotic", exuberantly colorful kinds of creations, however when it comes to wearing jewelry myself, I have a deep, basic yearning for clean, simple lines in jewelry (usually the hardest kind of jewelry to make really, really well). To my own surprise, this "Triangulation" jewelry sets really appeal to me. I particularly like the grounded-ness and the smoothness of feel and look in this "Triangulation Hematite" beaded necklace and handmade earrings. 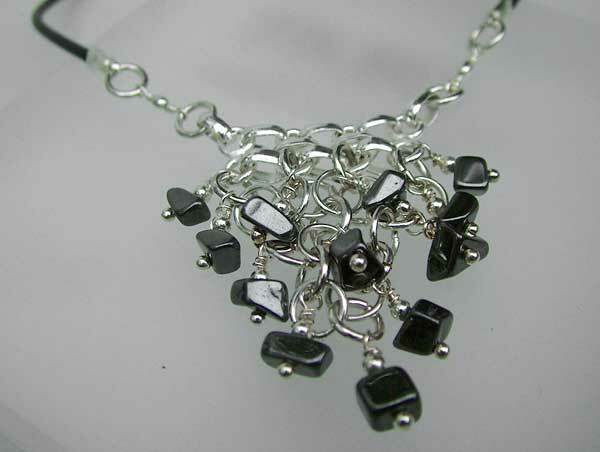 The hematite gemstones add a touch of immense peace and grounded-ness yet with a contemporary feel. I will not be adding a lot of work notes. 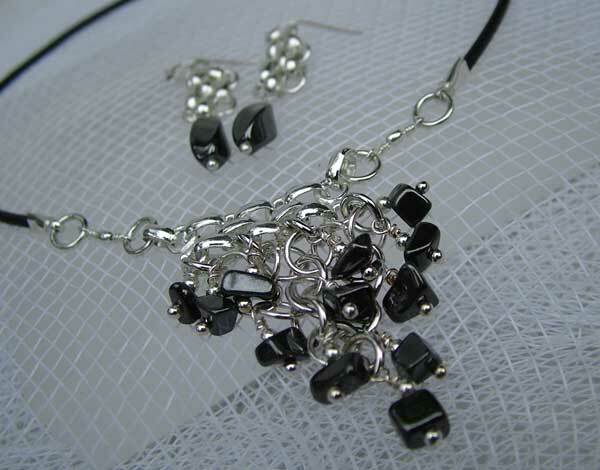 I think the photos themselves are quite clear enough to easily decipher the makings of this hematite beaded set. A note of the interlinked chain (at the top of the triangle chain maille focal section): I used some necklace chains I have and cut them up to create those sections. Most of the jewelry sets in my "Triangulation" series have matching earrings. I make the necklace first and then more or less, let the necklace speak to me as to how the earrings are to be so that they will be matching and complementary as a whole. For this "Triangulation Hematite" set, the earrings make use of the snippets from the interlinked chain I mentioned earlier to give the whole set a seamless flow. 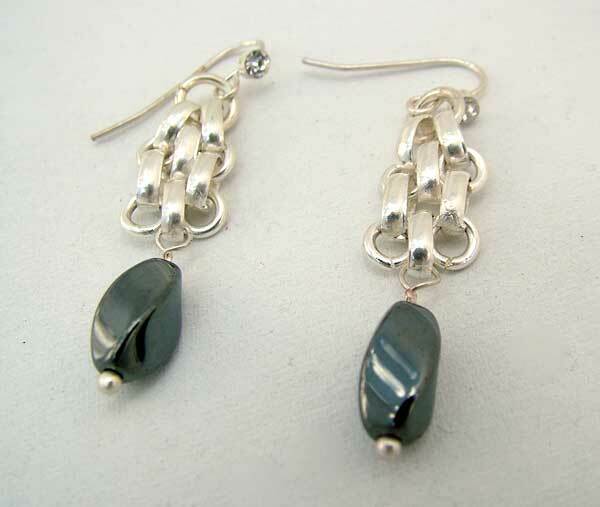 The smooth, twisted Hematite beads add to the fluidity and flow of the entire set. Again I have lots of photos here with enough details to take the place of written work notes so that it is easy for you if you wanted to figure out how the handmade jewelry is put together. Now, despite the fact that I think the chainmaille beaded necklace and the earrings go seamlessly together, one enhancing and bringing out the features, colors, and theme of the other, I am still listing them as separate items. I do realize that not everyone might, for instance, have pierced ears or are into wearing earrings but not necklaces, or vice versa. So by listing them separately, I hope that it will serve the most number of people. As I said earlier, I am using these photos in lieu of written work notes. It is quite easy to decipher the construct of the piece. I used latex, rubber like cording for the necklace. (Sorry, if there is a correct technical term for that kinds of cording, it escapes my mind at the moment). The necklace is finished off with Rhodium plated lobster claws (aka lobster clasp or parrot clasp). 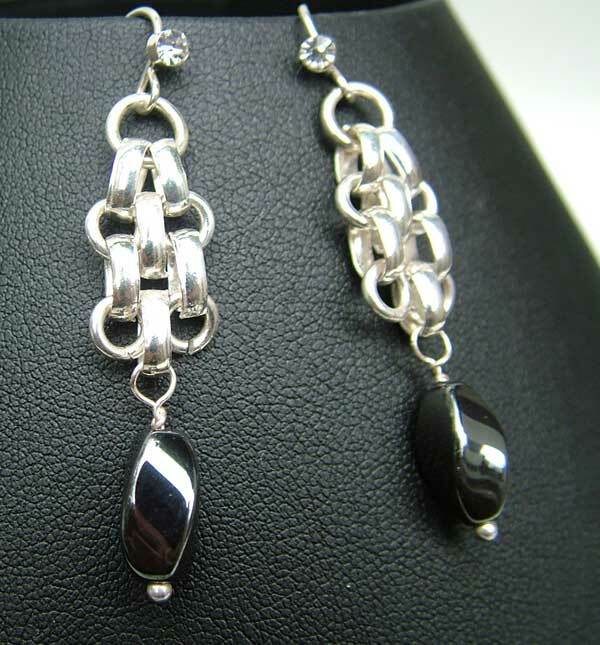 The earring findings are my favourite with crystal embedded in them for that delectable subtle and uplifting sparkle. Though each triangular base is slightly different for each of the necklaces in the "Triangulation" jewelry series, this below shows the basic set up. 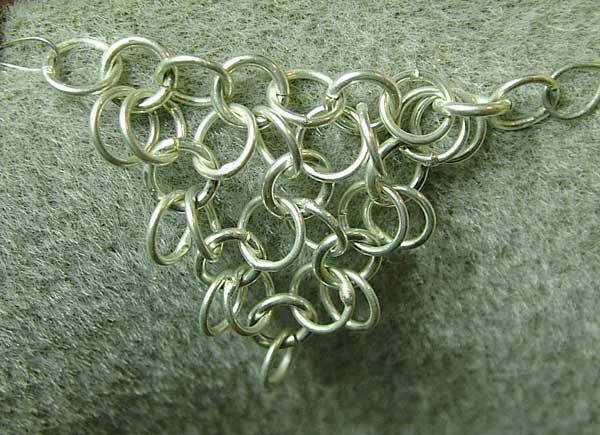 Those extra jump rings running along the sides of the triangular chain maille is especially useful if you want to hang additional dangle beads off them.